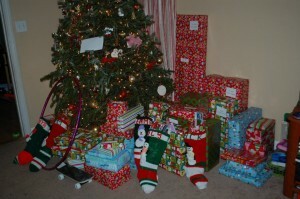 Christmas 2011 went by so fast. I’m sure having a newborn had nothing to do with that. There are not nearly enough photos but here are a few from the weekends festivities. We hosted Christmas Eve at our house and then Christmas Day we ventured over to the Venturas to celebrate Rachel’s birthday and exchange more gifts. Santa spoiled everyone! Lucy got her first American Girl Doll and Jack got his skateboard. Emme got cloth diapers! All in all things are a bit of a blur.